Who will win? Place your bets! I originally only gave this project a quick glance when it was seeking funds during its Kickstarter campaign but now that I've read a bit more about it, I'm actually quite excited by what it's aiming to do. Kingdom Come: Deliverance managed to raise over £1 million which far exceeded its original goal of £300,000 and it's apparently going to be a sandbox RPG set in 15th century Bohemia. While that sounds like an "okay" premise, there are a few extra reasons that has elevated this game into not only my anticipated PC games list of 2015, but Choona's as well (although I'm not sure of his particular reasons - these are my reasons :)). Firstly the game is being developed by Czech developer Warhorse Studios which has a lot of talent including the producer of the Mafia series, Daniel Vávra. Regular readers would know I'm actually not that big a fan of GTA clones and Mafia at face value can be considered one of them. However, I actually managed to like the Mafia games probably due to their historical settings and how immersive they were. The cities, the cars, the people, the fashions, the weapons, the chatter and even the soundtrack worked in perfect unison to transport you back to the early 20th century. 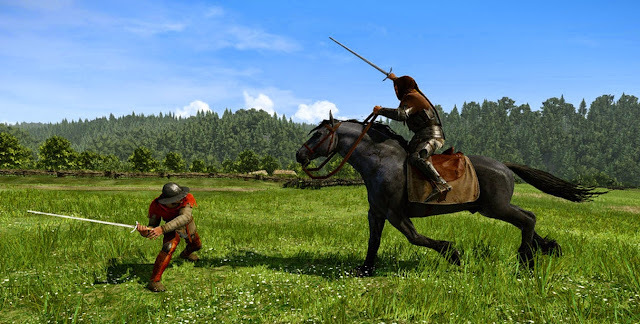 Warhorse Studios are promising us that Kingdom Come: Deliverance will be a historically accurate game with realistic content - if anybody can pull this off, I'm confident they can. The game is also being developed using CryEngine 3 and.... have you seen the screenshots? The videos? While you should always be a bit cautious with trailers (especially in this day and age), what's been shown so far is nothing short of amazing. So the game's definitely striving for stunning graphics too and at this point you're probably thinking "hmmm, good looking sandbox RPG set in medieval times, this sounds like a medieval Skyrim!" While that sounds already like a pretty good game, Kingdom Come: Deliverance is going one step further and implementing something you'd normally find in Bioware RPGs.